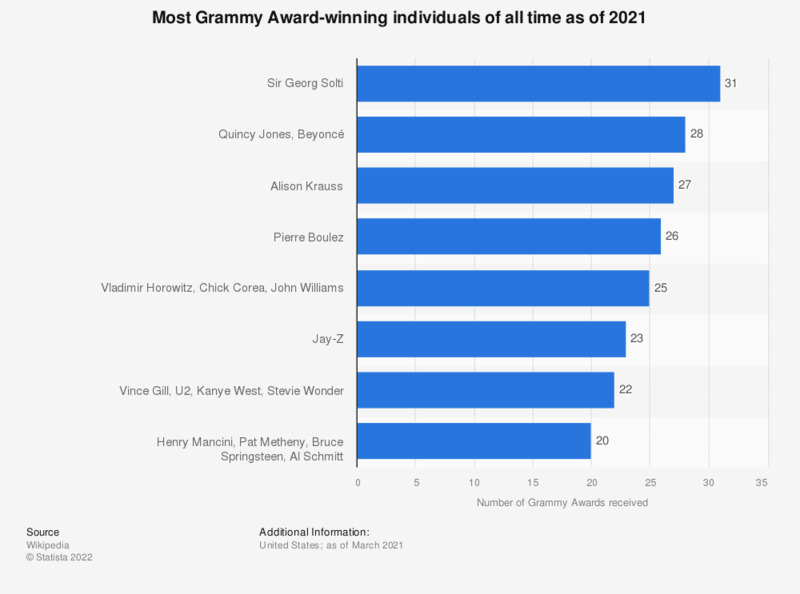 The statistic presents the most Grammy Award-winning individuals of all time as of the 2019 awards. Sir Georg Solti, an orchestral and operatic conductor, leads the pack with a total of 31 Grammy Awards won for recordings of works as diverse as Bach, Bartók, and Wagner. The Grammy Awards are annually awarded by members of the United States National Academy of Recording Arts and Sciences (NARAS) in recognition of excellence in the recording arts and sciences. They are the equivalent of other annual prestigious awards in the American entertainment industry, such as the Academy Awards - OSCARS (for motion pictures), the Emmy Awards (for television) and the Tony Awards (for stage performance). In 2018, The Grammy Awards celebrated its 60th edition and established some new industry records. Sir Georg Solti, who was the Chicago Symphony Orchestra conductor for 22 years, is the artist with most Grammy Awards won in a lifetime – 31 out of 74 nominations. Quincy Jones, prominent musician, conductor, arranger, composer, music, television and movie producer, is the most nominated artist of all time – 79 nominations, although in different capacities. Other records are less flattering for the nominees, such as that held by Morten Lindberg and Snoop Dogg, both topping a ranking of most Grammy nominations without a win. Additionally, the bluegrass-country musician Alison Krauss is the female with the most Grammy Awards – 27, followed by Beyoncé, with 22. The highest number of awards was presented in 2009, when artists and technicians were nominated in a record of 110 categories, but the number dropped since to 83 at the 2015 and 2016 editions, which were held at the Staples Center in Los Angeles. A total of 84 categories were contested during the 2017 and 2018 editions of the awards. Since the year 2000, the Latin Grammy is a separate ceremony which honors excellence in musical works recorded in either Spanish or Portuguese, notwithstanding their country of origin. Some of the artists who have received a large number of Latin Grammy Awards are Puerto Rican rap band Calle 13, Juanes, Alejandro Sanz, and Shakira. Mexico and Brazil are the countries with most Latin Grammy Awards – 136 and 135 respectively, as of 2015. How much have you seen, read, or heard lately about the 2017 Grammy Awards?